The colony management service provided by TCDM includes mouse husbandry, breeding, record keeping, identification marking by ear-punching and tail and/or ear punch biopsies for genotyping. Genotyping can be performed by the investigator or TCDM. 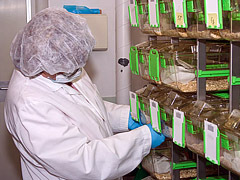 Euthanasia of negative or excess mice is one of the services that is included in colony management to keep the number of mice and costs at minimum. TCDM provides also technical expertise including drug administration, blood sample collection and colony management training for people with no previous experience in mouse work. Many experimental set-ups require the use of advanced surgical techniques. TCDM supports researchers by providing technical expertise on various experimental methods. In addition to the techniques listed below, other techniques may be available upon request. Techniques available are: Gonadectomy, Ovariectomy, Vasectomy, Ovary transfers, Mammary glnad transfers, Placing subcutaneous implants, Inoculation of orthotopic and subcutaneous tumors etc.